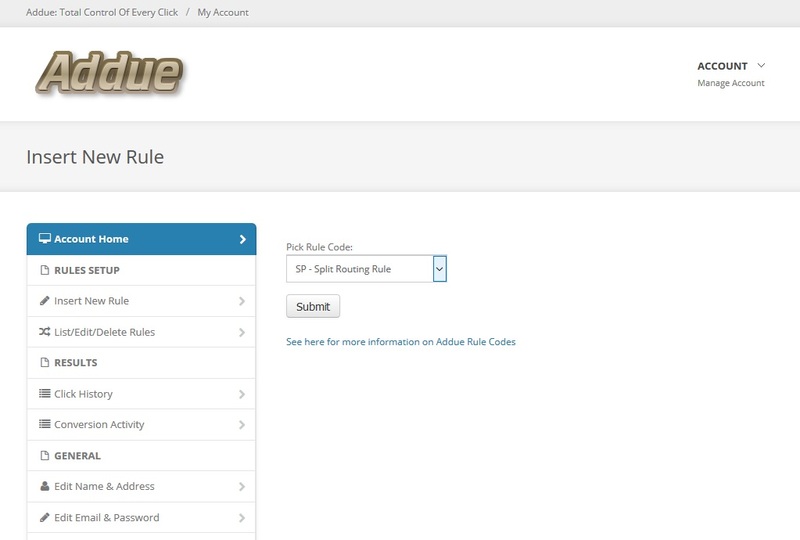 Rules and rulesets are how you control your internet traffic using Addue. 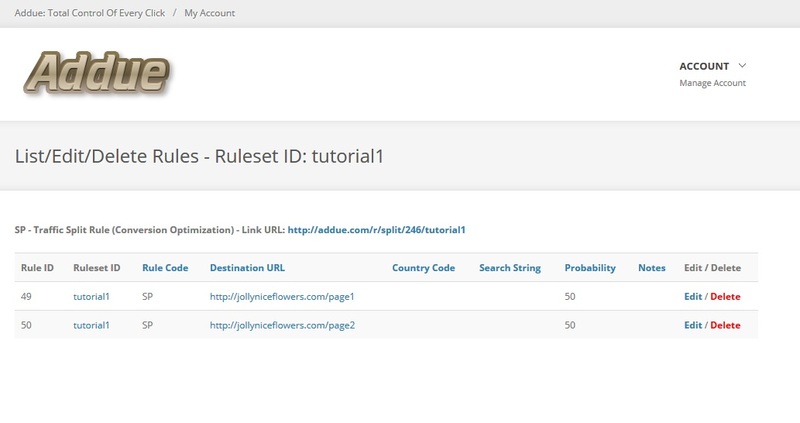 You can use any of Addue's functionality by setting up easy-to-understand rules in your Addue account, and combine them with eachother. Rulesets are special combinations of rules which accomplish a single function. Rulesets can then themselves be combined with eachother to accomplish more than one function. For example, you'd set up a bunch of rules and combine them into a ruleset to define one function like routing your traffic based on the country of its visitors. You could set up a separate ruleset to set up conversion tracking for your website. You could then combine those rulesets if you wished to accomplish both functions at once for your site visitors. In this introductory tutorial we'll talk about rules and combining them into rulesets. We'll look at combining rulesets with eachother in a later tutorial. We'll use the traffic splitting function Addue provides to illustrate the concept. Traffic splitting refers to taking your incoming stream of traffic and splitting it up into multiple landing pages. The most common use case is A/B optimization, where you'd also need to use conversion tracking rules to track the conversions on each of these landing pages. For the moment we won't be getting into any of that though - A/B optimization and conversion tracking will be covered separately in later tutorials. To set up some basic traffic splitting rules, let's suppose your website was http://jollyniceflowers.com (doesn't actually exist last time we checked!). Let's also suppose you had two landing pages on this site you were experimenting with and wanted to send half your traffic to one, and half to the other. We'll call these pages http://jollyniceflowers.com/page1 and http://jollyniceflowers.com/page2 for this tutorial. In your Addue account, under "Rules Setup", click on Insert New Rule. 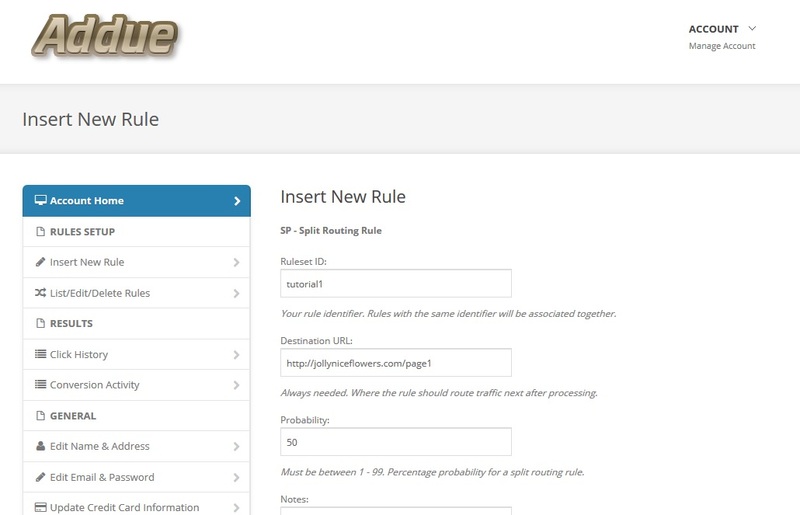 On the next page, choose the "SP - Split Routing Rule option". SP is the two letter code used on Addue to refer to traffic splitting rules. All Addue rules have such a two letter code. The form that comes up on the next page is where you actually create the rules. The first thing you need to enter is a ruleset ID. This is a name you come up with that uniquely identifies the traffic splitting rules you're creating. We'll need to create a couple of rules to accomplish the traffic splitting functionality we want, and each of them need to have exactly the same ruleset ID so they'll be tied together. This will become clear in a moment. Under ruleset ID, enter "tutorial1". Under destination URL, enter the URL of the first page we want to send traffic to - http://jollyniceflowers.com/page1. Under probability, enter 50. Probability refers to the fact that you want 50% of your traffic going to this page. Your form should look like the picture above. Leave the notes field blank and hit submit. Congrats on entering your first rule! If you ever need to edit or delete a rule, the Edit/Delete links on the listing page in the right hand column can be used for this. By itself, this rule you just entered is insufficient. We just instructed Addue that half of our traffic needs to go to http://jollyniceflowers.com/page1. We now need to tell Addue that the other half needs to go to http://jollyniceflowers.com/page2. To do that, go back to your main account page (choose Manage Account from the Account tab in the top right). Then click on Insert New Rule again. Choose the SP - Split Ruling Rule option again. We're now entering the second rule on the next page. Under rulesetID make sure to enter "tutorial1" exactly as you did for the first rule. This creates a ruleset of 2 rules - the one you're entering now and the one you just entered. Rulesets are rules which Addue has to process together. When traffic for your website comes in, Addue will look at both of these rules in deciding what to do with, which is you want. Under destination URL, enter http://jollyniceflowers.com/page2 and under probability enter 50. This page is also assigned a 50% probability like the other landing page, meaning that each of them will have a 50-50 chance of being presented to site visitors. 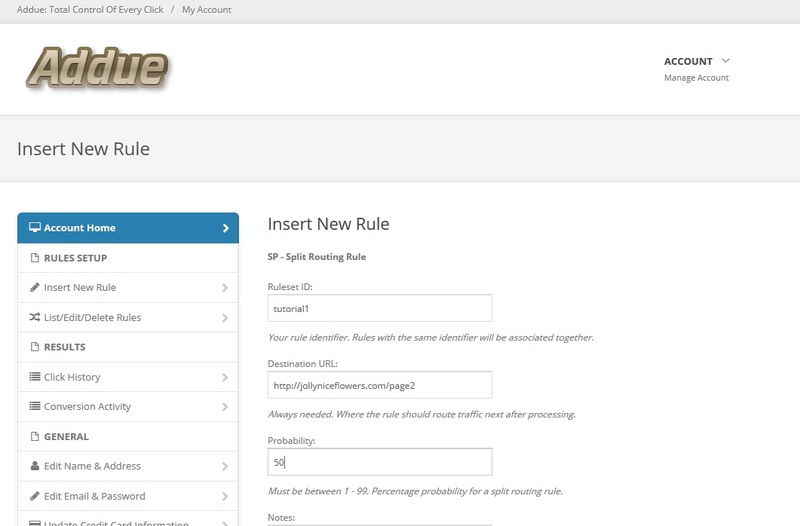 Once you hit submit you can take a look at your rules under List/Edit/Delete Rules. You should be able to see both rules you entered. just click its ruleset ID in any of its component rules. (The number 246 between split/ and /tutorial will be different for you - it's your unique account ID on Addue). Click on this link a few times. You'll see that the traffic sometimes goes to http://jollyniceflowers.com/page1 and sometimes to http://jollyniceflowers.com/page2. Addue is correctly routing the traffic in a 50-50 percent probability ratio to these 2 pages. Effectively it's throwing a coin each time the link is clicked to figure out which landing page to use for that click. 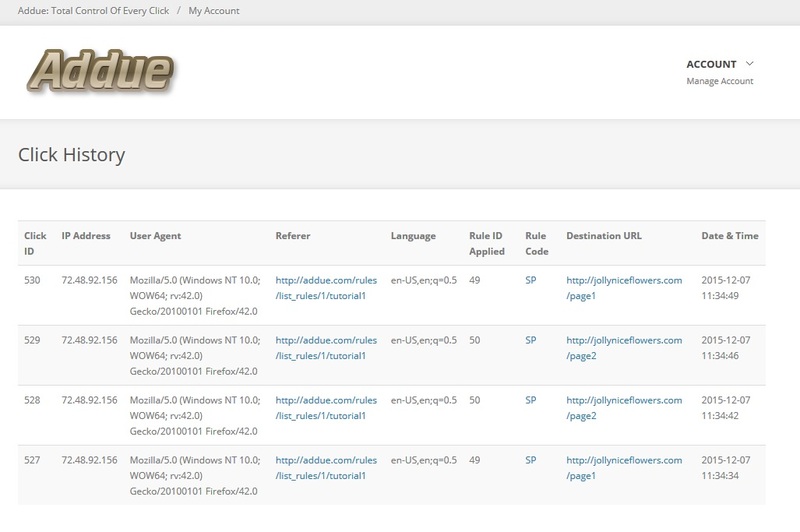 Each line on this report screen represents a click hitting your Addue link, along with other data such as the IP address it's coming from, where Addue decided to send it (destination URL), and the rule ID applied. And that's it for this tutorial. We'll start learning more about each of Addue's available rule types in the next tutorial, starting with IP-based country traffic routing. Traffic splitting rules themselves will be examined in more detail too, in a later tutorial.